SEPTA released its proposed $548.63 million Fiscal Year 2017 Capital Budget and Fiscal Years 2017-2028. SEPTA receives 60 percent in funding from the State of Pennsylvania, 38 percent in federal funds and 2 percent in local funding from the five Pennsylvania counties served. You can access the full budget proposal here. The 2017 capital budget includes investments in the long-awaited SEPTA Key (new payment system), new regional rail passenger cars, upgrades to transit stations and various safety and technology upgrades. A summary pie chart of budget spending is on p. 11 of the Budget Report. BCGP reviewed the budget with an eye to how the budget incorporated the bicycle amenities suggested in the April 2015 SEPTA Cycle –Transit Plan (see blog post here). The Capital Budget allocates a total of $2.5 million for the Bicycle Access to Transit Program. SEPTA is committed to investing in covered bicycle parking at 8-10 regional rail stations in 2017. All new stations will have bicycle parking incorporated into the design. For details see SEPTA’s blog post here. SEPTA will upgrade the bicycle parking at select stations along the Market Frankford and Broad Street Lines. For details see SEPTA’s blog post here. The planned acquisition of new regional rail rolling stock provides a rare opportunity to provide additional space for bicycles on regional rail. Rolling stock has a long lifetime. (The retiring Silverliner IV railcars are 40 years old!) Adding amenities upon acquisition is more cost effective than retrofitting later. BCGP has urged SEPTA to include more, dedicated space for bicycles on regional railcars. SEPTA is purchasing 45 new multi-level push-pull passenger railcars (delivery 2019-2020). These 45 multi-level cars will have two bicycle storage locations per car. Details of the design and capacity of these storage locations are not yet available. SEPTA will also be replacing the Silverliner IVs regional rail cars, which date from 1974-1976, with new Silverliner VI cars at a cost of $1.1 billion (over 6 or more years). These cars are scheduled for delivery in 2022 to 2028 and beyond. The Bicycle Coalition has requested that these cars provide bicycle storage that does not share space with handicapped seating as they do in the current Silverliner Vs, that were acquired in 2010-2013. SEPTA has assured us that the new Silverliner VI vehicles will have a minimum of two bicycle storage locations. However the details of the design of the storage or if they will share space with handicapped seating is not yet determined. Safe bicycle parking at all parking facilities planned at regional rail stations, rail transit and transportation centers. 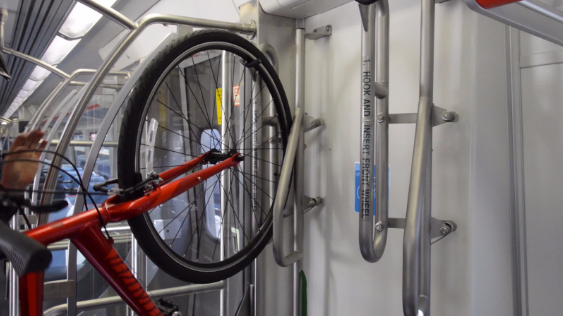 Below is a picture of bicycle storage on the Denver’s Silverliner V light rail cars. This is the type of storage the Bicycle Coalition would like to see on the Silverliner VIs. For pictures showing how this storage operates, go to this link. If you would like to submit your comments on SEPTA’s proposed budget, you may do so via email or the web. Click here for details.